Buttermilk – the word just sounds like a heart attack in a carton, but that couldn’t be further from the truth. Buttermilk is every great cook’s secret. We do it for the tang, we do it for the tenderness, but above all we do it because it’s the right thing to do. And just to be clear, buttermilk is not a block of butter bathing in milk, it’s lower in fat than regular milk, and is the slightly sour “milk” left after butter is churned, hence “buttermilk”– think yogurt. 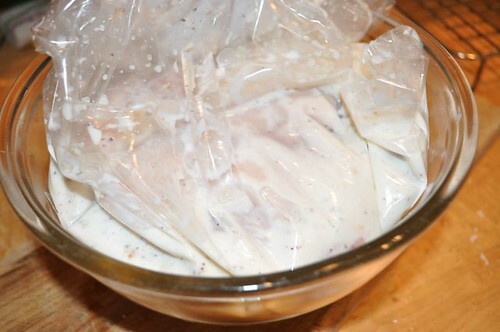 Any protein marinated in buttermilk for any length of time results in meat that is well, like butter. Smooth, creamy, moist and buttry! Welcoming buttermilk into your pantry is like hiring a sous-chef who creates the magic while you’re not looking. 1. 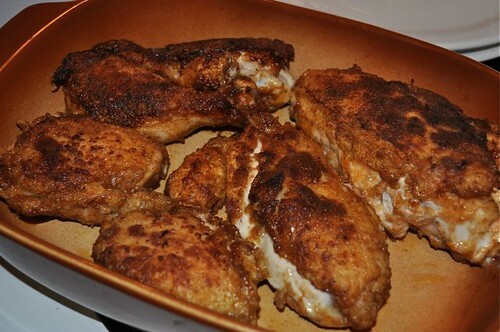 Gather the players – chicken, buttermilk and seasonings. 2. 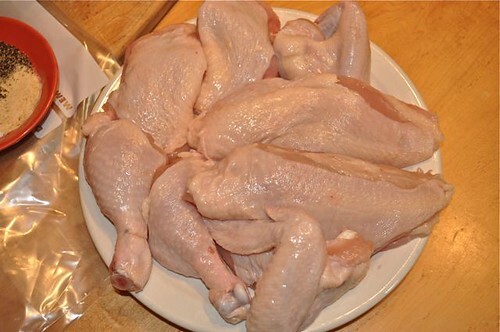 I cut up a whole chicken into 8 pieces – 2 legs, 2 breasts, 2 wings & 2 thighs. However you arrive at your pieces – they’ll all work. FYI – save the carcass for stock – bag & toss in the freezer for later. 3. 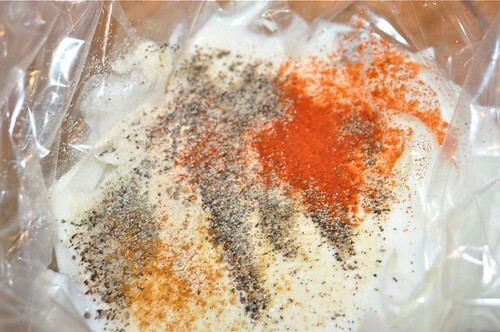 Line a bowl with a ziploc bag and add the marinade ingredients – buttermilk, onion/garlic powder & s&p. 4. 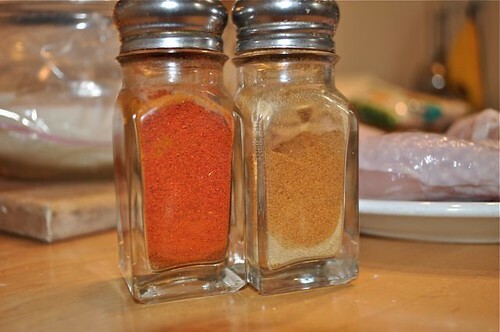 And because I can’t stop messin’ with my marinades – paprika and cayenne join the party for a little colour & as big a kick as you’re in the mood for. And if you really want to heat things up, bring on a few shots of hot sauce to the wet marinade. 5. Now, that’s what I’m talking about. 6. Stir it all around. 7. 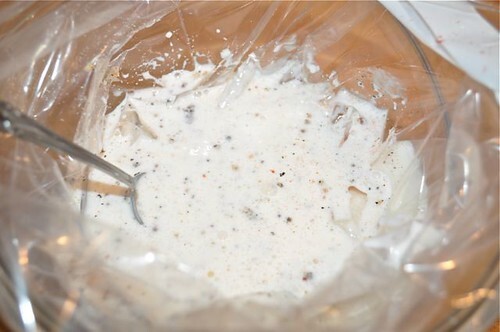 Add the chicken pieces to the buttermilk mixture. 8. And swish around to coat thoroughly. 9. 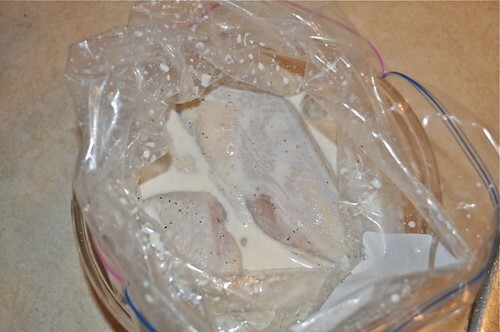 Seal the bag, keep it in the bowl, and refrigerate ’til it’s time to fry. This can marinate anywhere from a couple of hours to overnight. 10. 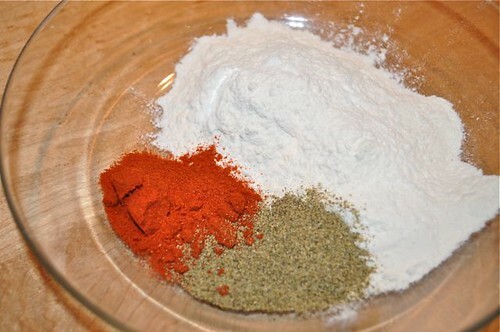 Get your dry ingredients together – flour, cayenne, paprika, salt & pepper. 11. 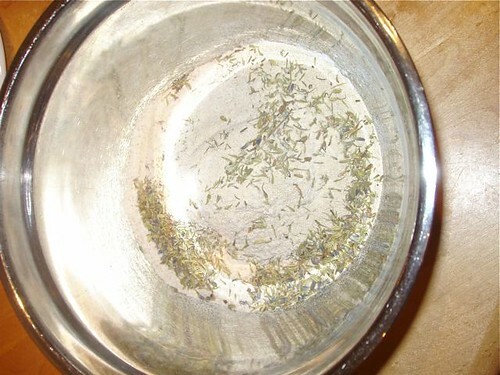 Or add a few herbs (I didn’t this time, but I could have) – it’s your chicken, make it your own. 12. 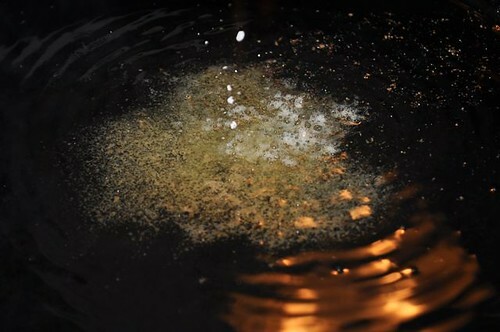 Mix together well – this is the coating which is how it all gets so crispy and I-really-came- from-a-bucket-like. 13. 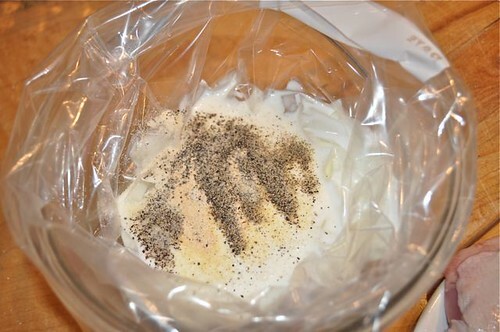 The easiest way to drain off the mariande is to dump the contents of the ziploc bag into a colander in the sink. Let drain for a minute or two – easy, peasy. 14. 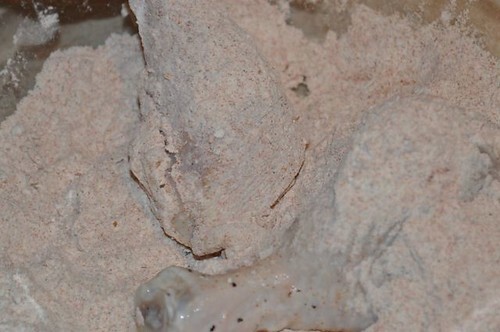 And start dredging – a fancy word for roll that chicken around in the dry mixture, shake off any excess and lay it on a platter to get ready for the hot pan. 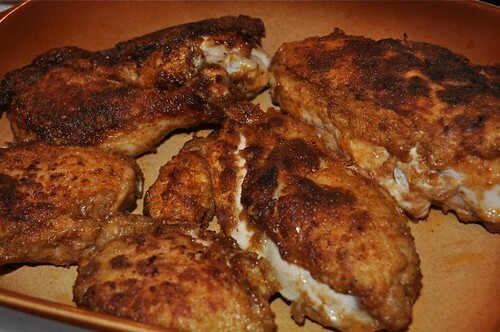 Turn your oven to 250° to warm up which is where you’ll hold your pan-fried chicken until you’re ready to devour it. 15. Keep dredging until there’s nothing left to dredge. 16. 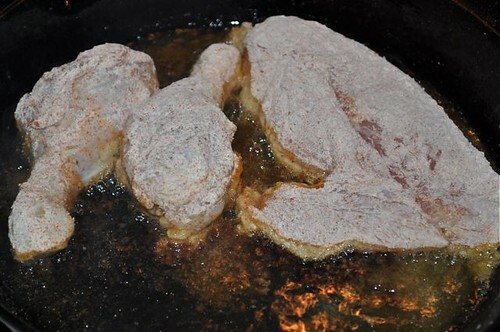 Heat up a pan (or 2 if you need it) to smokin’ and generously coat the pan(s) with oil – we’re frying after all. 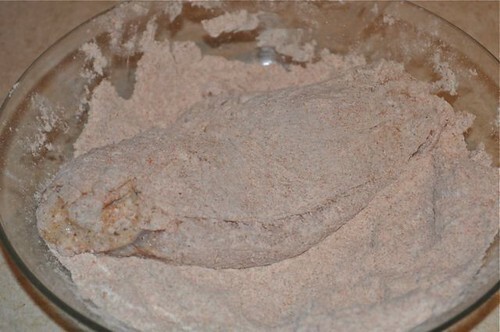 Sprinkle in a teeny bit of flour, if it sizzles, you’re good to go. 17. And start layin’ (carefully) down the chicken pieces. 18. 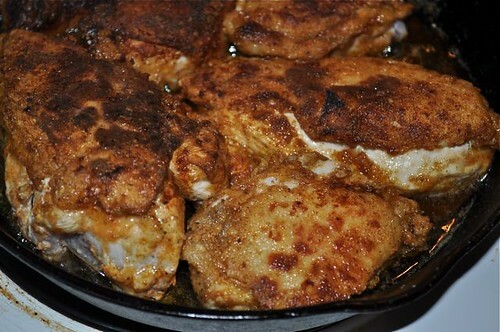 Get all your chicken in the pan – resist the urge to touch them until the edges begin to brown – that’s the chicken saying, “hey, flip me over”! 20. Move them to a serving dish, stand back, admire, accept the oooo’s & aaahhhhs – you just made an award-winning pile of gloriously crispy, fried-but-not-really-fried chicken. Preheat a frypan(s) large enough to hold all your chicken. Heat until almost smoking. 3. Preheat the oven to 250°. 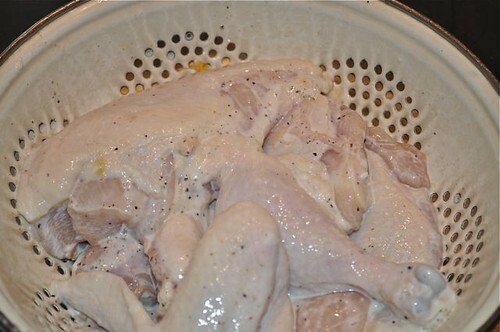 Place the chicken in a colander to drain. And start dredging in the dry mixture. When the pan is nice and hot – generously cover the bottom of the pan(s) with vegetable oil – a sprinkle of flour will sizzle when it’s ready to go. 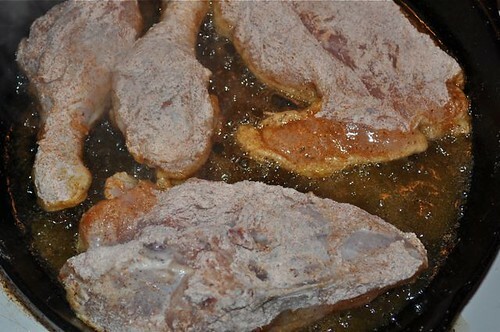 Lay the chicken pieces in carefully and cook for 10-12 minutes. 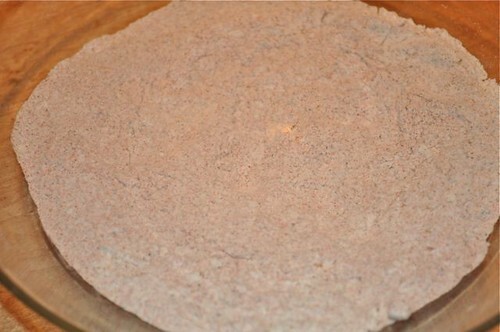 When the edges have browned nicely, carefully turn them over and brown on the other side for another 10-12 minutes – total cooking time is 20-25 minutes. Drain on papertowel and keep warm in your preheated oven until ready to serve.